Death was just a breath away for a Siberian skier who fell through the thin ice of Lake Baikal, with teeth-chattering temperatures dropping to -15. His miraculous rescue by a friend standing nearby was captured on his own GoPro camera. 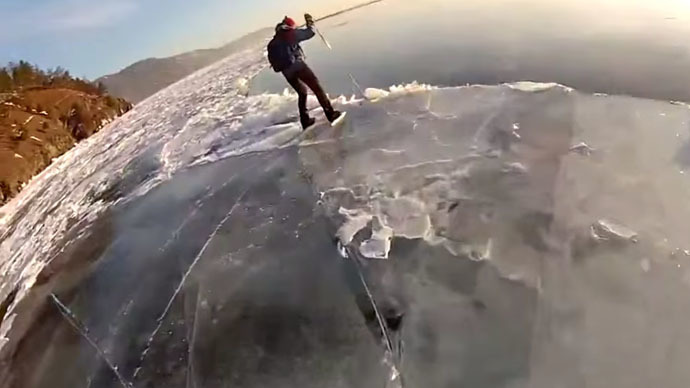 Sergey Ivanov and his friends had been skiing along the frozen top of Lake Baikal, on the same route as the annual Ice Storm race, some 70 kilometers away from Irkutsk, the Siberian Times reported. The adventurers expected the ice to be strong enough to hold them – usually temperatures plunge to -30C in February. However, due to a warmer winter the ice was only five centimeters thick in certain places. So, shortly after their daredevil ski journey began, Sergey found himself plunging into the world's deepest freshwater lake. His friend Ilya came to his rescue quick as a flash, and managed to drag Sergey out of the water using his ski pole. "There was no time to think. I made a jerk to the side and grabbed the ski pole. I got out on the ice with difficulty. To be honest, I wasn’t scared, probably because I didn’t have time. It was lucky my friend was nearby," Sergey told the newspaper. Sergey came ashore, clothes frozen solid, changed in his car and returned to Irkutsk. "My relatives didn’t even notice anything, but were surprised that I was back so soon," he said.